Roku-chan: I know I often ask this, but please listen to me, dear Buddha. Please make my mother smarter. Kurosawa's best films often had a combination of warmth, which is present in essentially every film he ever made, and bleakness, which seems to pop up only every two or three films, as if Kurosawa were prone to depressive spells. This unique blend of moods can be found in "The Idiot", "Drunken Angel", "The Lower Depths", and again here, in "Dodes'ka-den", a heartfelt examination of human misery, which, like all Kurosawa films, lacks the intellectual and artistic mastery of many of his contemporaries, but also possesses a warm humanism that very few filmmakers have ever been able to achieve. 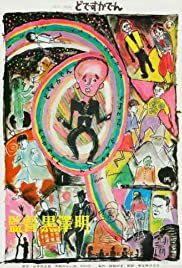 Released in 1970, "Dodes'ka-den" (the quirky title is explained in the film's first sequence) saw Kurosawa at a critical juncture in his career. Entering Japanese cinema later than his classical Japanese contemporaries (i.e. Ozu, Mizoguchi, Naruse), but before the Japanese New Wave crowd that would follow (i.e. Suzuki, Imamura, Teshigahara, Ôshima), Kurosawa occupied a unique place in Japanese cinema. His films were very western in both style and content, and they broke from the more traditional values of Japanese filmmaking. Prior to "Dodes'ka-den", Kurosawa was able to get by with a profoundly felt film once every four years or so, while filling out the in-between years with exercises in shallower classicism usually based in the chanbara (samurai) genre of Japanese cinema. Strangely, these latter films — "Seven Samurai", "The Hidden Fortess", "Yojimbo", "Sanjuro" — were often championed the same as the others. Granted, they were effective, sometimes wonderful exercises in entertainment, but they tended to lack both the vision and the thematic depth that marked his best films. For that reason, I was delighted to see "Dodes'ka-den" be the type of film it was: simultaneously despairing and humanistic, since I didn't really know what to expect from this one. Kurosawa himself had remarked, after his last film, "Red Beard" (1965), that he felt he had reached the end of a certain creative cycle, and that whatever happen from that point forward, it would be different. It certainly was. Television had become an increasingly dominant aspect of Japanese culture, diluting the devotion of Kurosawa's previously loyal fan base, and Kurosawa himself seemed to be entering a kind of artistic down-cycle. The rise in popularity of television meant Japanese producers were making less and less money, and were therefore less and less willing to take risks on artistically innovative films. In 1966, Kurosawa's long-term contract with Toho expired, and a troublesome detour through Hollywood ensued. Kurosawa and David Lean were set to direct the Japanese and American sequences, respectively, of the 1970 film "Tora! Tora! Tora! ", but neither man ended up directing a single shot for the film. Ultimately, this failed undertaking, along with a series of other issues in Kurosawa's professional life (his broken relationship with longtime collaborator and screenwriter Ryûzô Kikushima; exposed corruption within Kurosawa's production company), sent Kurosawa's career into a downward spiral from which it appeared he might never recover. Indeed, the next decade was a dark one for Kurosawa. He was desperate to make another film, but was struggling. Then something happened that has become one of my favorite off-screen moments in cinematic history. Three of Japan's most famous filmmakers — Masaki Kobayashi, Keisuke Kinoshita, and Kon Ichikawa — came to Kurosawa's rescue, and the four of them formed a production company called the Club of the Four Knights, to whom the concept for "Dodes'ka- den" is credited during the opening titles of the film. The idea was for each of the four filmmakers to direct one film each, but this never happened, and it has been said that true motivation for the formation of the company was to support Kurosawa and help a titan of Japanese cinema to get back on his feet again. It was a beautiful gesture, one too uncommon in the often dog-eat-dog world that is the film industry. Unfortunately, it didn't pan out. "Dodes'ka-den" had a small degree of critical success, but was a box office failure. The film lost money, and in 1971 Kurosawa attempted suicide by cutting his wrists and throat. Fortunately, he survived, and a few years later he was approached by the famous Soviet film studio, Mosfilm, to make a Russian film. That film, "Dersu Uzala", which I've not yet seen, was moderately successful both financially and critically, beginning Kurosawa's recovery as a filmmaker. Still unable to find financing for a new project in Japan, though, he was assisted by none other than George Lucas, a massive Kurosawa fan, in making his next film, "Kagemusha" (1980), for which both Lucas and Francis Ford Coppola were producers. It was the first of Kurosawa's final five films, a period during which he regained his status as a master filmmaker. As for "Dodes'ka-den", Kurosawa's despair is palpable throughout, but so is his warmth and compassion for humanity. It was Kurosawa's first color film, and the color palette is quite beautiful. The film isn't successful at every turn, but it is on the whole. It has very little plot, meandering back and forth between the various inhabitants of what is closer to a trash heap than a town (maybe a small step up from the setting of "The Lower Depths", which is the film I'd say "Dodes'ka-den" has the most in common with). Some viewers, hopelessly addicted to plot and story, might find fault in this, but I wouldn't share that criticism. I felt that the film's drifting plot line gave "Dodes'ka-den" its greatest strength: a narrative that, like its characters, wanders from place to place in search of meaning and happiness, and, like its characters, having not found it, settles down here, in this den of hardship and human suffering, where goodness and sorrow exist side-by-side, unconcealed by the pretensions of a "regular" society that may be less impoverished, but is also less honest, and, for Kurosawa, ultimately less human.